Every Thursday is Throwback Thursday and each week we relish the opportunity to do a deep dive into the treasure chest of old funny video clips . Two years ago we posted a segment of Johnny Carson's Tonight Show from 1984 where Buddy Hackett talked about the TV censors denying his First Amendment rights to use a three letter word meaning "buttocks." He launched into two jokes that illustrated his point. We found the second part of that segment where Buddy tells a few more on the same theme. But don't worry, he may get close to the line where censors would pounce but he doesn't cross it. Classic delivery, impeccable timing, corny jokes, but OH, such a breath of fresh air from what comedians say today. Proves you can be funny and not explicit. Loved it! 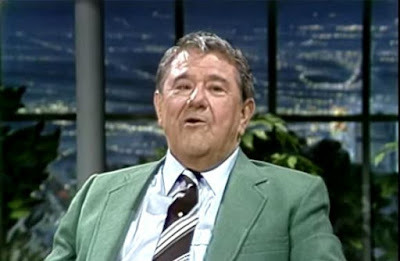 Saw Buddy Hackett in Las Vegas and his was blue! Hilariously dirty!